By reducing the focal length of the telescope (for example, a 500mm focal length becomes 300mm), this 0,6x reducer/flattener increases the area framed by the camera sensor. In addition, decreasing the focal ratio of the telescope (for example AIRY APO80 f/6.25 becomes f/3.75), it allows you to record weaker details. Designed for photographic use with AIRY telescopes, it offer an extended correct field and it can be used with many different refractors. The 0,6x reducer/flattener into 50.8mm connection of the focuser (in front it has a thread for connecting 50,8mm diameter filters). Rear (camera side) it has a T2 male thread and therefore it can be screwed directly onto the DSLR cameras ( using a T2 ring of the camera brand) or to a CCD camera (with T2 female thread). 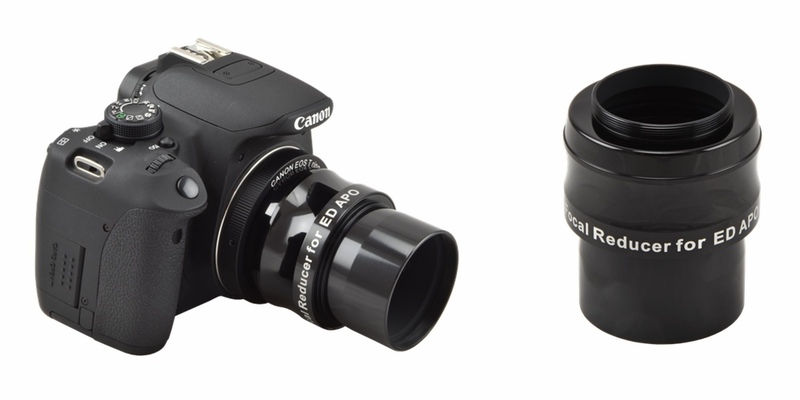 So, for example, if you use a QHY8L CCD camera that has 20 mm backfocus, the T2 you need will be: 55 - 20 = 35mm.